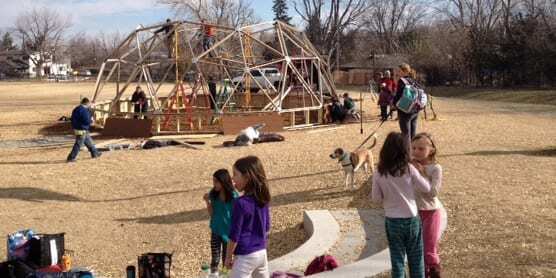 Boulder, CO March 10, 2014 – On Friday students, parents and staff at Columbine Elementary are holding an “Open Greenhouse” – the first chance for the community to check out their recently constructed 33 foot-diameter geodesic Growing Dome Greenhouse. The new greenhouse is considered a pilot for BVSD schools, expanding their current Garden to Table program for year-round gardening and a hands-on learning center for students. Installation and construction of the Growing Dome Greenhouse has been organized over the last five years by Columbine Elementary PTA volunteers and was made possible thanks to generous donations from Columbine Elementary families, staff and community members, as well as community partners including Whole Foods Market, Growing Spaces, ReSource Boulder, Maxwell Family Fund, Morningstar Homes, Skycastle Construction, Green Roofs of Colorado, Western Disposal, City of Boulder Family Resource Schools, BVSD Facilities, and more. What started as a design idea as part of Columbine’s remodel in 2012 has become a reality. 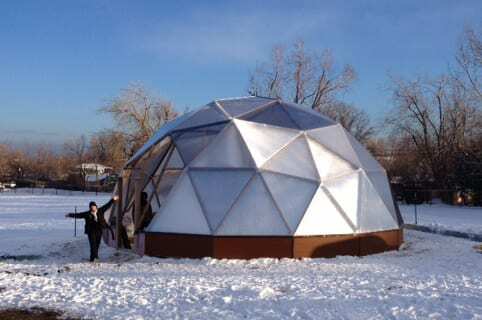 The Growing Dome was constructed the first four days of March by approximately 30 volunteers – parents, teachers, neighbors and community members, with two supervisors from the company that makes the geodesic domes, Growing Spaces. The greenhouse is designed to be off-grid – requiring no supplemental heating. It features a water tub that acts as a heat battery, with solar powered fans, waterfall, and also LED motion-sensor lighting thanks to Citizens for Clean Energy. Programs in the Greenhouse are free to students and taught by GrowingGardenseducators. Teachers are invited to sign up for classes which are aligned with grade level academic standards and complement lessons taught through the Growe Foundations’ Garden to Table Program. From learning about seeds, edible parts of plants to life cycles, aquaponics and gardening for health to greenhouse growing design and planting, the comprehensive Greenhouse education program is truly a 21st Century learning lab experience reaching approximately 500 students per year through school and after school programs. Columbine PTA invites community members to join for the “Open Greenhouse” ribbon cutting ceremony on Friday, March 14th from 3:00 PM – 4:30 PM at Columbine Elementary.